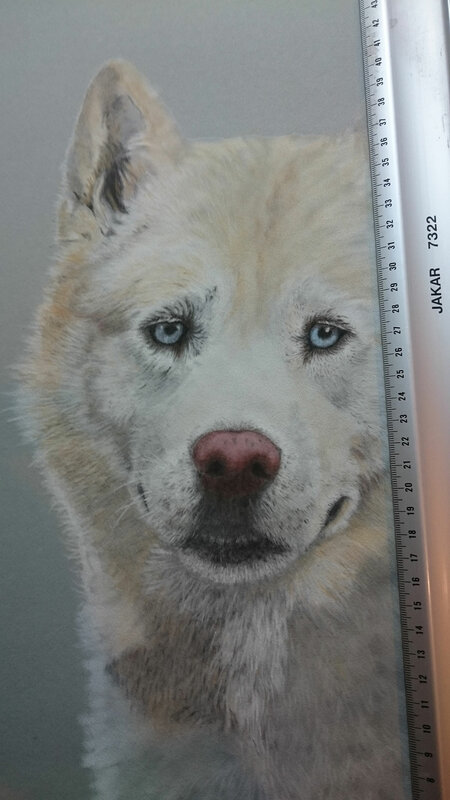 Another pastel portrait on velour. Two gorgeous Huskies on one picture in time for someone’s Christmas present from Santa. Here you can see ‘Spirit’, the first of two dogs. This one is proving to be a challenge with getting the colours spot on but I DO love the challenge. One of my biggest problems of late is getting the colour correct….Not because of the lack of my ability to do so but of my `Printers` ability to actually print out the correct colour in the first place which I always do for ease of reference. The client sends me a digital image/photo that I then enlarge and print out for my reference when starting the portrait. This helps me to get the perspectives etc correct. Just lately though I`ve found myself asking the clients (if possible) to call in and agree the colour specs before I start or shortly afterwards. Stay tuned for the completion of ‘Spirit and the addition of ‘Storm’ the second of the two dogs.